The evilest is still Episode 21(alternative source) of Barefoot Friends. I like good stories and came across Dracula Untold. I didn’t like it very much. Maybe it’s because of my heightened sensitivity for anti-islamic racism. Or maybe it’s because the main theme of the movie seems to be that: it’s OK to join the forces of evil as long as your intention is to protect your family and your country … if that makes sense to you, it doesn’t to me. They try to accomplish this by twisting the historic context both with regards to the time and place, the persons involved and in the loyalties they had. Also they try to convey that Evil is not something despicable in itself, but a tool to be used by the powers in charge. I assume you’ve seen the movies and can relate tho following facts to the plot and the characters. Why choose the lesser evil? Besides, running away is never the answer, unless you are a teenage boy who has just blown up a mailbox. As Americans, we need to stay here in America and work things out, because regardless of what color or hue of state we live in, we are all, deep down inside our undershorts, Americans. And as Americans, we must ask ourselves: Are we really so different? Must we stereotype those who disagree with us? Do we truly believe that all red-state residents are ignorant, racist, fascist, knuckle-dragging, NASCAR-obsessed, cousin-marrying, roadkill-eating, tobacco juice-dribbling, gun-fondling, religious-fanatic rednecks; or that all blue-state residents are godless, unpatriotic, pierced-nosed, Volvo-driving, France-loving, left-wing communist, latte-sucking, tofu-chomping, holistic-wacko, neurotic, vegan, weenie perverts? 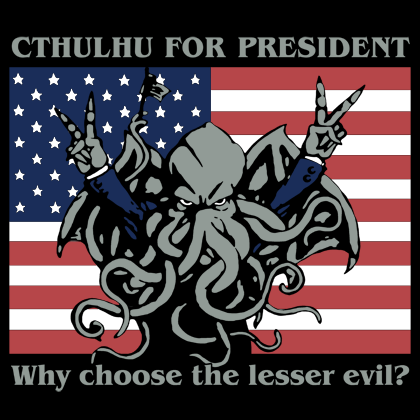 Cthulhu For President – Why choose the lesser evil? Format LinkPosted on 17.09.2012 Categories EnglishTags Cthulhu, Evil, Politics, tongue-in-cheek, USALeave a comment on Why choose the lesser evil?